Your first reaction after watching this brutal trailer for the new film adaptation of the classic 1940s-1950s TV show The Three Stooges is....a simple yet understood heavy sigh. Even though the TV show relied on genuinely funny (read: silly) slapstick comedy, a big screen version, in 2011, just seems nonsensical. 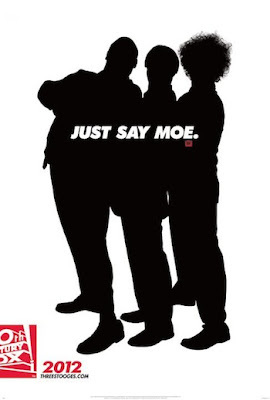 Sean Hayes, Chris Diamantopoulos and Will Sasso step into the roles of Larry, Moe, and Curly (respectively), and not even they can make the movie look a little more clever. There's a point when stupid funny just comes off, well, stupid. Directors Bobby and Peter Farrelly (Me, Myself and Irene and There's Something About Mary), aka the Farrelly brothers, are known as masters of this genre, but their dumb luck must have just run out. It's really too bad, because Sofía Vergara, Jane Lynch, Larry David, and even Jennifer Hudson (who all make appearances in he movie) deserved better than this vehicle. It's a doggone shame. The Three Stooges opens in theaters April 13, 2012. The Three Stooges just do not fit in with the year 2011. That's all it really is. That has to be the worst trailer I've seen in a long long while, looks just horrible! The Three Stooges was not technically a "TV show." These were theatrical short subjects shown before main features in movie theaters in the 1930s, '40s and '50s, each running between 16 and 18 minutes in length. When TV became popular the shorts (like those of Laurel & Hardy) became a popular way for broadcasters to fill half hour time slots, often with a "host" (like "Officer Joe Bolton" in New York City) doing intro's and of course, commericals.